FORT GREELY, Alaska -- A mobile maintenance small-arms repair team from the Arizona Army National Guard completed a weapons and night vision goggles inspection mission at Fort Greely, Alaska, for the Alaska National Guard's 49th Missile Defense Battalion June 22-25, to assist the Alaska Guard and help foster relationships between the two states. The Arizona Guardsmen, assigned to the 3666th Support Maintenance Company from Phoenix, worked together with Alaskan Guardsmen during 3666th's 15-day annual training to help the 49th MDB's mission readiness. The Soldiers who traveled to Fort Greely are small-arms repairers and computer/detection system repairers, said Chief Warrant Officer 3 Domingo Gonzales, the 3666th SMC's armament maintenance foreman for the mission. "They are designed to go out to different locations and gauge and repair weapons as necessary as part of a larger maintenance force," Gonzales said. During the mission the Arizona Guardsmen inspected and gauged approximately 600 weapons and nearly 100 night vision goggles. "Gauging is part of preventative maintenance service for crew served and individual weapons," said Gonzales. "It's part of the annual or biannual inspection process to verify the weapons are serviceable, mission capable and safe to operate for the warrior." A weapon's inspection includes measuring the straightness of the weapon's barrel, checking the headspace, looking for worn or broken parts, completing a functions check and notating any deficiencies found said Sgt. Michael Restrepo, a small-arms repairer and squad leader with the 3666th SMC. If a deficiency is identified the weapon is tagged for repair. 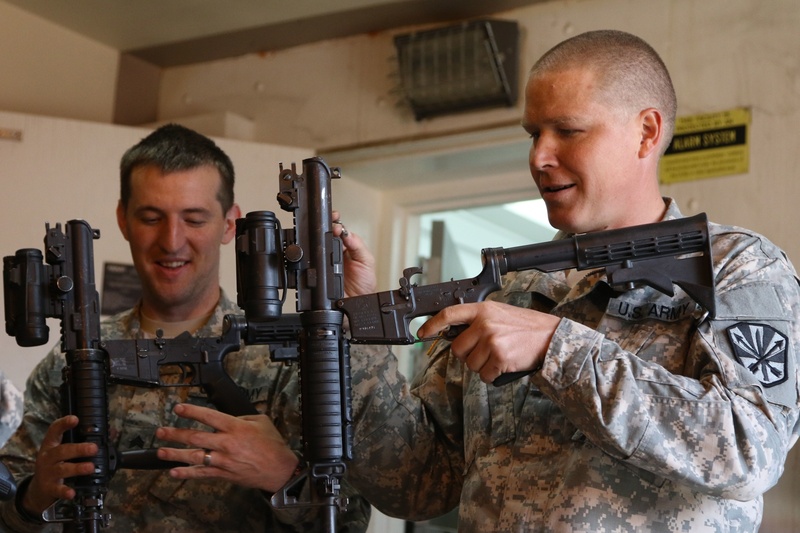 Arizona Guardsmen inspected and gauged a variety of weapons to include M-9 pistols, M-4 Rifles, M-26 shotgun, M-320 grenade launchers, M-249 squad automatic weapons and M-240 machine guns said Alaska National Guard Sgt. Marshall Webb, a small-arms repairer with 207th Battalion Support Company at Joint Base Elmendorf-Richardson. "Having Arizona here helps a lot," said Webb, who is currently the only small-arms repairer for the Alaska National Guard. "Normally it would take a full week." This is the second time the 3666th has traveled to Alaska to assist the Alaska Guard, completing a similar mission in 2014. Gonzales said the training opportunity in Alaska lets Arizona Guardsmen perform real world missions in an actual operational environment. "Having a force multiplier like the 3666th come in, it gives them an ability to gauge more weapons then they would do normally with only one person available for the Alaska Guard," said Gonzales. While at Fort Greely, Arizona Guardsmen traveled to different armories where each weapon was disassembled, inspected and gauged, and night vision goggles were tested. Restrepo said he loved the opportunity to travel to Alaska for this type of mission. "It's cool that Alaska is requesting us to come over here and help them out because maybe one day they might have to come help us out," Restrepo said. "It's nice to work and build those relationships with other states." The Arizona Guard's small-arms and computer/detection systems repairers also conducted inspections at Joint Base Elmendorf-Richardson and Fort Wainwright. Small-arms repairers and computer/detection systems repairers have an important job to keep the Soldiers weapons and equipment functioning as intended. "This mission is helping sustain the force by providing a cost effective means to ensure the weapons are serviceable and catch any types of malfunctions before they become a serious issue, keep our Soldiers safe and keep our weapons in the fight," Gonzales said.